Way back in September, I profiled the artwork of artist Mari Kasurinen, who brought Star Wars to My Little Ponies. This past week, her work jumped into the almost-mainstream when her custom My Little Pony collection shot to the front page of Digg. I’m not saying I’m a star-maker or anything, but… you can say it. Megatron was fully sculpted with Apoxie sculpt. I plan on making a few Transformer customs in the near future and a redo of Optimus as that was my first fully sculpted custom and I think I could make him a whole lot better now. 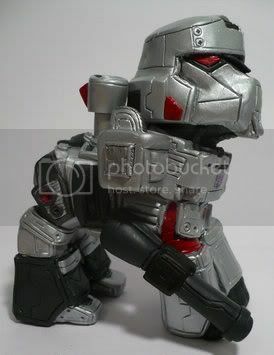 The Mega-Pony-tron already sold on Ebay (for 73 American dollars! ), but you can follow Amy’s Ebay profile to keep on top of her future Transformational Pony listings. That is just absolutely fantastic. Creepy as hell, but fantastic nonetheless. Awesome. I’d set it up there with all my porcelain dolls and see how long my guy friends would want to hang in my room. Nice work to the star maker and the artist!